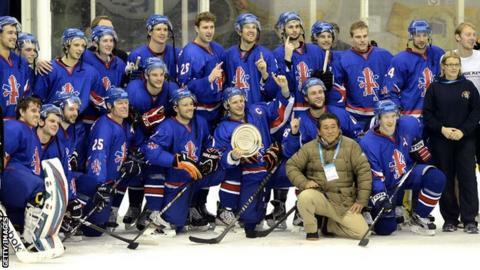 Defenceman Danny Meyers says Great Britain's ice hockey team can this week qualify for their first Olympics since 1948. The men's team travel to Latvia to face the hosts, as well as France and Kazakhstan, with only the group winner progressing to Sochi 2014. "We feel we have the ability and the belief," Meyers said. "For us players, this is what we have dreamed of for so long and we are going to take the opportunity." The team reached this final stage of Olympic qualification after an historic and perhaps surprise victory over Japan in November, which head coach Tony Hand believes can be the catalyst for further success. "I'm trying not to get too carried away but to get to this level shows there has been a lot of good work done," Hand told BBC Sport. "I think our team morale and the fact we battle for every loose puck is one of our strengths. "We have to play as a team for us to get any success and we'll need a little bit of luck - but you just never know." Great Britain, ranked 21st in the world, the lowest in their group, will begin their campaign against pre-tournament favourites Latvia [11th in the world] on Thursday, before facing France [14th] the following day and Kazakhstan [17th] on Sunday. "We all know it is a huge tournament with some really good players and teams," said GB and Nottingham Panthers centre Matthew Myers. "It's going to be a tough group to qualify through. "Every game will be crucial if we want to qualify, especially that opening night in front of the Latvian fans. Hopefully we can come out on the right side of the scoreline." Great Britain's only Olympic medal success in the sport came back at the 1936 Games in Garmisch-Partenkirchen, Germany. That team was captained by Carl Erhardt who passed away in 1988, but his son Philip still possesses a large collection of his father's Olympic memorabilia. The sport was boosted with a funding grant of £63,000 from the International Olympic Committee last month and know performances in Latvia will be crucial to their prospects of attaining future financial support.